The comic book series that inspired SyFy's new hit TV series, VAN HELSING, finally releases its very first cover gallery issue! 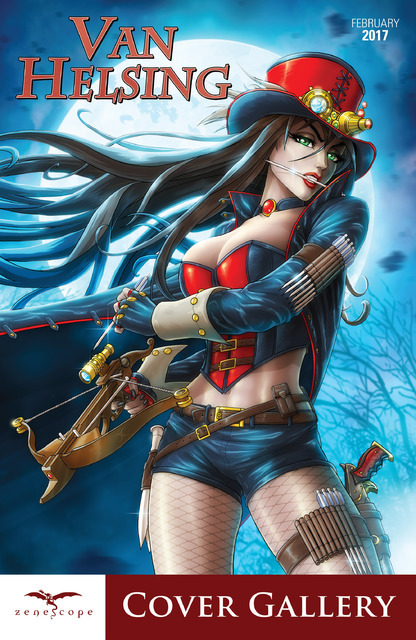 Liesel Van Helsing, Zenescope's British steampunk vampire hunter, is one of comics' most iconic and stylistic heroines. And some of the best comic book artists in the industry have drawn her to perfection. With artwork by names such Jamie Tyndall, Richard Ortiz, Paul Green, Sean Chen, and many others, this insanely gorgeous Van Helsing Cover Gallery is a must-have for any fan!